Broccoli is a good source of fiber, vitamins A and C, calcium and iron. There are three common methods for cooking crunchy broccoli on its own, although the Centers for Disease Control and Prevention recommends steaming or microwaving broccoli to ensure it maintains it nutritional content. Season broccoli with cheese, butter or lemon and serve it as a side dish, on top of rice or mixed with other greens for a tasty salad. Rinse the broccoli in cold water and pull off any brown or damaged florets. Cut off most of the stem using a sharp knife, leaving only a couple inches of stem below the florets. Then use the knife to carefully cut each floret off the stem, chopping them in half to reduce their size, if necessary. Fill a medium pot with a few inches of water. The water should not reach high enough to touch the bottom of your steamer basket once inserted. 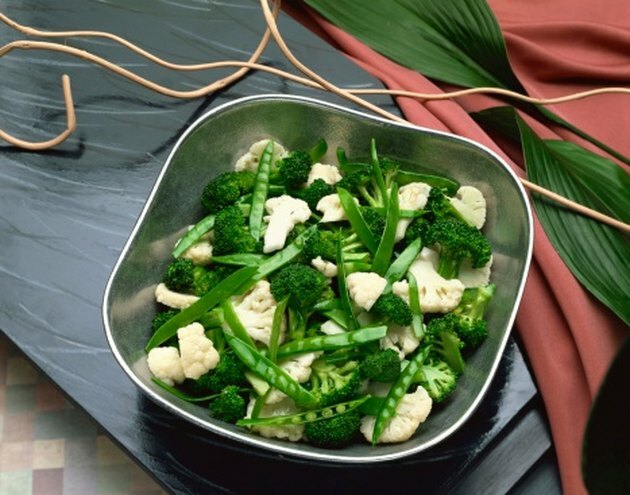 Place the broccoli florets into the steamer basket, and then put the steamer basket into the pot of boiling water. No water should enter through the steamer basket holes. Cover the pot and steam the broccoli for about 4 to 5 minutes, or until the florets are just tender but still retain some crunchiness. Bring a medium pot of lightly salted water to boil and then toss in the cleaned and cut floret pieces. Boil the broccoli florets uncovered for 4 to 5 minutes, or until the broccoli is just tender. Drain the broccoli in a fine mesh strainer before serving. Arrange cleaned and cut broccoli florets evenly around a microwave safe dish. Larger stem pieces should face toward the outside of the dish. Spoon 2 tbsp. of water evenly over the broccoli pieces in the dish. The water will help prevent the broccoli from drying out in the microwave. Cover the dish and microwave on high for about 5 minutes, turning halfway if your microwave does not turn automatically. Allow the broccoli to stand in the covered dish for about 4 minutes after cooking. Be careful not to overcook broccoli. Overcooking broccoli causes it to become mushy, reduces its color and flavor, and diminishes its nutritional value.